Detailed list of ingredients can be found here. 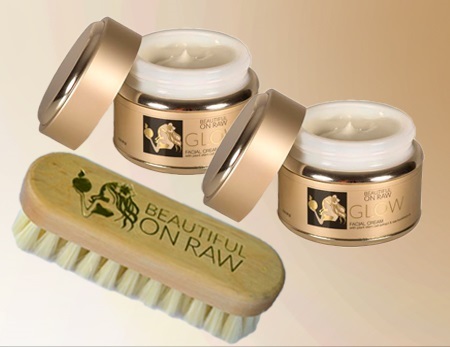 What makes Beautiful on Raw GLOW Facial Cream so Special? There is a "secret" ingredient in Beautiful on Raw Facial Cream, a secret about to be revealed. That ingredient is Sea Buckthorn Oil. Sea Buckthorn plant (Hippophae rhamnoides - no, you won't find this one in your neighborhood nursery) is native to mountainous regions in Siberia. And this year's new formulation I have TRIPLED the amount of Sea Buckthorn Oil! Creating this cream has been a labor of love. I have carefully selected each ingredient and I am committed to keeping it the best quality possible. After 2 years of research into 30 companies, I finally have a product that I am willing to stand behind 100%! Sea Buckthorn Oil aids in reducing the effects of the sun’s harmful rays on the skin, including burns, irritation, dryness and itchy patches that are typical in many common skin conditions. Its nourishing, revitalizing action seems to have practically no limit. In fact, the extract of Sea Buckthorn berries has been used for centuries in Asia, Russia, and Scandinavia, due to their belief in its inherent restorative properties. The value of the annual production of Sea Buckthorn products in China exceeds $20 million, yet the Sea Buckthorn is virtually unknown in the West. Tonya, I recently purchased your cream. I love it. I thought it would simply not damage my skin. I have very sensitive skin. But, it is wonderful. My skin looks like satin. With the brushing I see a real difference in my skin. There is a polished look. Much like you have. Only it will take time to have a complexion that compares to yours. Thanks for sharing with all of us. 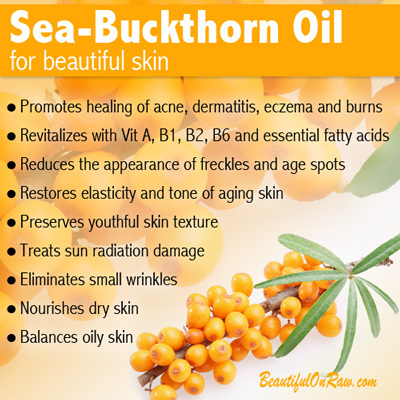 The red and yellow berries of the Sea Buckthorn contain a high percentage of several essential vitamins including Vitamins C, E, and beta-carotene (pro vitamin A). The vitamin C content is among the highest for any plant. Combined, these vitamins can serve as powerful antioxidants, known for their ability to combat wrinkles, dryness, and other symptoms of aging or neglected skin. Now with Apple Stem Cell Extract! We added plant stem cell extract taken from a very rare variety of apple - the Uttwiler Spätlauber apple.This is probably not a name that you're familiar with, but that’s to be expected. The use of the Uttwiler Spätlauber was first recorded over two hundred years ago in Switzerland. Not recognized for its taste, growers instead noticed that it stored better and for longer than any of the other varieties. While other apples wrinkled and withered, Uttwiler Spätlauber was still firm and fresh. With this in mind, Swiss researchers have extracted stem cells from the Uttwiler Spätlauber variety and believe that these cells can help aid stem cells found in our own skin to remain firmer and “fresher” for much longer. Their research has shown promise that these extracts have properties that slow down the effects of aging on the skin, and could be the next big thing in the cosmetics industry. The Beautiful on Raw Facial Cream contains a patented, sought-after and highly reputable ingredient called AQUAXYL™. Derived from natural sugars, AQUAXYL™ helps to hydrate your skin, improving water reserves and limiting water loss by realigning cutaneous water flow to better moisturize and strengthen the skin. In simple terms, AQUAXYL™ creates a barrier through which the water in your body can not escape. It helps to defend your skin against external damage resulting from dryness, temperature or pollution. Not only is this the product that everyone with dry and/or sensitive skin has been waiting for, but AQUAXYL™ can also greatly benefit anyone who wants to protect their skin from the elements. Tonya...I just began using the cream with the facial brush two days ago and can already see and feel the difference! This is a first and I've used so many different creams in my 54 years. My face has not been this smooth since I was a child. Last night when I went to bed my husband even noticed how good my skin smelled. I recognize the vanilla and he said that he was a fan. Thanks so much! Although I'm weaning myself off cooked foods and not 100% yet, I'm loving my raw diet evolution. I can't wait to share progress pictures as I transform my life. Thanks so much! Changing your lifestyle as completely as you do when you go raw, you become more sensitive to certain outside influences that previously had no effect. Some ingredients, which were never a problem for a person consuming a cooked food diet, become like poison to a raw food person. The same thing might happen with skin care products. Based on this idea, I started creating and using my own homemade cream. After years of refining the formula, I was able to produce an excellent facial cream, and have been sharing its many benefits with my customers. I've been using variations of this cream since I was 30- that's over 20 years. In 2006, I was able to start sharing this product and its benefits with my customers, and this Beautiful on Raw™ Facial Cream has consistently been our most popular product. Click here to learn all about the ingredients of my Beautiful on Raw "Glow" Facial Cream with Plant Stem Cell Extract and Seabuckthorn Oil! My specially formulated cream contains wild crafted and organic essential oils and certified organic herbs that have been shown to encourage the development of new cells. The cream has an exquisite and delicate floral aroma. No artificial fragrances used in this process, the scent was created using 100% natural essential oils. The ingredients include oils of almond, coconut, mango seed, sesame seed and avocado. The consistency of this cream is really light and fluffy. These are the main characteristics of the "mousse" style, the latest trend in the cosmetic industry for skin care products. The Beautiful on Raw Facial Cream is soothing and has anti-inflammatory properties. It can be used on any type of skin, including sensitive skin. It can be used as a daily moisturizer because it nourishes dry, dehydrated skin, leaving it feeling firmer and softer. It can be used under makeup foundation or as a soothing aftershave cream. The cream does not leave a film residue, since the ingredients are quickly absorbed by the skin. Tonya ... Thanks so much for getting that wonderful face cream and brush to me so quickly. The brushing feels fabulous,and the cream is such a treat to use. The texture and scent is divine. Thanks again. Blessings and good health. Tonya, I have been using your face cream with outstanding progress. I had a mole on my cheek that has been there for years, now it is almost gone, it has lightened up to almost not being able to even see it now. So I need another jar of your cream. Is the Cream Raw and All-Natural? Even if a truly "all-raw" product could be formulated, it would have the same fate as the fruits or vegetables that sit in your refrigerator for more than a week. The product would have to be refrigerated, and even then, after a few days, mold would begin to grow, and it would not be safe to use. My dilemma was to formulate a good cream that would last. I certainly did not want to run to the kitchen to create a batch every time I needed moisturizer! The production of enough of my cream to sell to others meant that I had to consider the perishable nature and short "shelf life" of truly all-natural products. Oils can become rancid, and natural extracts can get moldy or develop pathological bacteria as they travel between different regions of the country or even overseas as well as when they sit on a shelf. I needed to find a way to avoid having my cream go bad without using toxic substances. The goal was to find a preservative that would not harm your skin, would not introduce toxins into your body, and could be used at the smallest possible concentration while at the same time be able to prevent the risk of microbial contamination. As a result, we are using a new Ecocert-certified, organically-certified preservative system. Ecocert, a certification body for sustainable development, is one of the largest organic certification organizations in the world. I LOVE your cream! Between the brushing and the cream, my skin feels very, very soft and even after just using it this short time, it has a glow to it. Soon I will have to order another jar of your cream, and I also plan on getting a jar for my teenage daughter. Three weeks ago we started using your beauty cream and the facial brushing procedure (we are up to 60 seconds a day) and our skin is looking really good. Until I started your diet 6months ago I could not sit in the sun or even use filtered water on my face as it was red and rashy. My husband had some nasty skin cancers around his eyes but since applying the cream daily the cancers are almost gone. We were at our organic food shop the other day and the lady serving us looked at my husband’s face and told him what beautiful skin he had. She then commented on the lovely smooth healthy looking nails he had. We love the cream so much that we ordered another 4 jars along with your new book due for release next year. Thank you for your help and information and the cream is just fabulous. The cream will work even better if you practice the mantra: Beauty is as Beauty eats! Eating right is a vital way to develop your outer glow. In my eye-opening books I reveal the details of how natural foods have helped me to achieve beauty at a later age - and how you can do the same! I have produced this cream to supplement the power of raw eating. I am justifiably proud of my Beautiful on Raw Facial Cream, and I want you to be completely satisfied. Tonya~ Hi from Minnesota. I HAVE to tell you how wonderful your cream is. Since I began dry brushing and using your cream, my eczema has all but disappeared (it was QUITE bad and painful). I have very, very sensitive skin and have struggled with eczema since my early teens. I am about 50% raw at this time. I can't thank you enough for your wonderful cream and the brush you included with it. I am only 34 and I know that with continued use I will continue to look younger than my actual years. Thanks again for all you do! I have such confidence in the cream's purity and power, that I offer a 60-Day money back guarantee. Try our cream. Use it regularly, as indicated. It will revitalize your skin, rescuing it from the ravages of dryness, redness, and minor inflammation. You will notice how well it moisturizes and freshens your face, accentuating your natural beauty. However, if for any reason you are less than completely satisfied, simply return the unused portion for a full refund (less S/H). Tonya, I purchased your BR Facial Cream about a month and a half ago, and am so happy to finally have a product that nourishes my super dry skin. I have always used organic products, but this is the first cream to actually keep my skin moisturized throughout the entire day. Along with the facial brushing and about 65% raw diet I have more supple and radiant skin than ever. Another great point is that your cream is so gentle I did not have any problems with break outs switching from my current skin moisturizer to yours. I love it!! Thank you so much for sharing your wonderful beauty secrets.